The meteor also created a sonic boom so loud that police and fire departments in Parker County received phone calls from distressed locals who thought there had been an explosion. The American Meteor Society received reports from people in Colorado, Oklahoma, and Kansas as well. 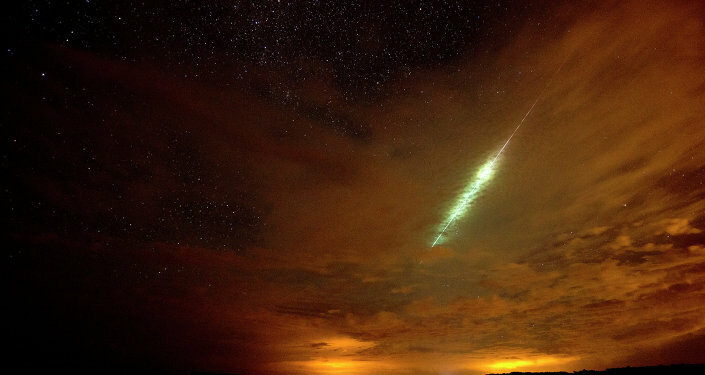 The meteor was spotted as far west as Arkansas. Weatherford police officer Tiffany Vanzant's patrol car dash camera captured the meteor streaking across the sky, looking like a spear of light. "Officer Vanzant had a front-row seat to a truly spectacular sight, and thanks to her in-car camera and a little movie-making magic, we want to share it with everyone," the Weatherford Police Department said. "It is important to note that there were no space aliens hurt in the making of this video!" Nathan Fines, a deputy fire marshal, claimed to have heard a crack like thunder when the meteor made its flyby. "You could see a flash, like if an electrical transformer flashes at night, up to our northwest, but it was cloudy here — kinda rainy — so we didn't actually see any kind of fireball or anything," Hines told the Lubbock Avalanche-Journal. Mike Hankey with the American Meteor Society said that Earth is hit with hundreds of meteors a day but only a tiny fraction have the size necessary to produce a sonic boom. "A lot of people think it's something hitting the ground," he told Lubbock. "Actually, like 10 miles up into the atmosphere creates that sonic effect that's like a rumbling sound or an exploding sound." The meteor likely made landfall somewhere in Lubbock County, 50-100 miles southeast of the city of Lubbock, according to Hines. "Local residents, just be on the lookout for any weird black rocks," he said, adding that the rocks would be unusually heavy and smooth.